Microsoft figured out how to put a discrete GPU into the Surface Book, and it paid off. Of course we had to pit the Surface Book vs. the MacBook Pro. It’s like Ford vs. Chevy, or Coke vs. Pepsi. Each side has its diehard fans, plus others who just want to know which is better. 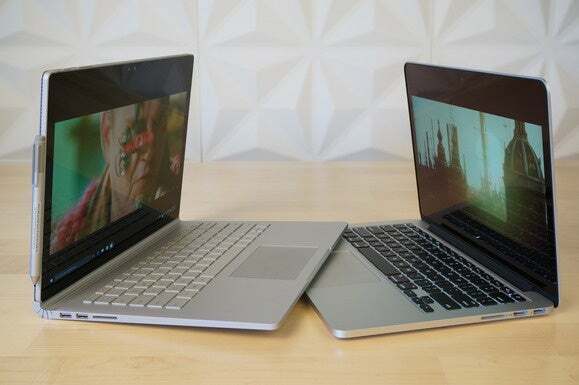 Microsoft claims its new Surface Book is “twice” as fast as its equivalent MacBook Pro. Well, we ran some benchmarks, and hate to say it, but Microsoft lied. The Surface Book isn’t twice as fast. It’s three times as fast. First, let’s clarify what Microsoft meant when it said the Surface Book would smoke the MacBook Pro. The company specifically means the MacBook Pro 13 inch model. That’s a very important distinction, because the MacBook Pro 15 is a different class of laptop. It’s larger, heavier, and packs a quad-core CPU and fairly beefy AMD discrete graphics. For Microsoft to say the Surface Book out performed the MacBook Pro 15 would be absurd. It would be like Apple saying the MacBook Pro 15 outperforms, oh, an MSI GT 80 Titan SLI laptop in gaming. So the target for the Surface Book is the MacBook Pro 13. Microsoft even compares the two directly in its reviewers guide. For my tests, I had access to a 2015 MacBook Pro 13. But the only Surface Book I had with the discrete graphics chip had an Intel Core i7-6600U. That's not a fair comparison, but I had a workaround. Microsoft had also provided a Core i5 Surface Book without discrete graphics. Microsoft is still pretty secretive about the GPU in the Surface Books, but I don’t believe it’s putting a different GPU in the higher-end models. I just plugged the Clipboard section with the Core i5 into the base with the graphics chip in it. Neat. So for the record, I tested a Retina MacBook Pro 13 with an Intel Broadwell Core i5-5752U, Iris 6100 graphics, 8GB of RAM and PCIe SSD, and the latest El Capitan build. Its rival was a Surface Book with an Intel Skylake Core i5-6300U, GeForce graphics, 8GB of RAM and PCIe SSD with Windows 10. First up were some CPU tests. Cinebench R15 is a cross-platform test that uses a real-world 3D rendering engine from Maxon. 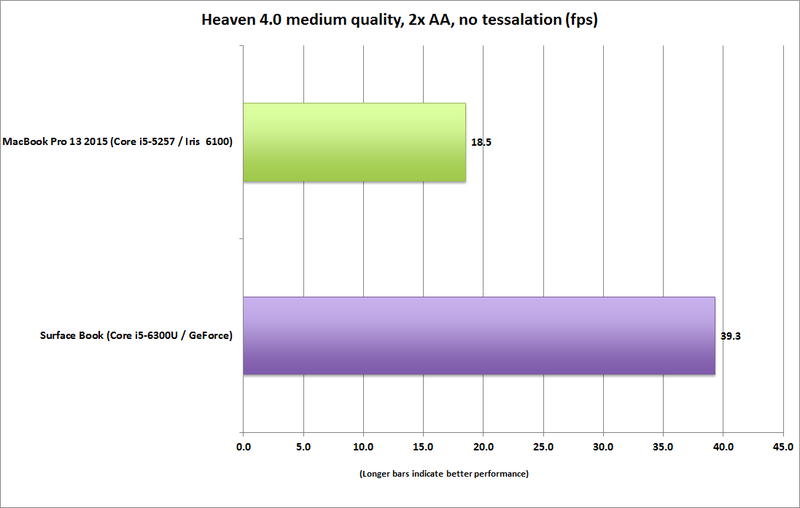 The test is pure CPU, so let’s see how Microsoft’s “twice as fast” statement holds up here. Not what you expected, PC fans? Consider the CPUs. The MacBook Pro 13 uses a pretty high-wattage, dual-core 28-watt chip with a base clock speed of 2.7GHz. That means it sticks to 2.7GHz even when under a load, and it’ll Turbo Boost to 3.1GHz. The Skylake dual-core in the Surface Book is a 15-watt chip; its minimum clock speed is 2.4GHz with a Turbo Boost of 3GHz. Even though the Skylake CPU is faster than the Broadwell CPU in the MacBook if all things are equal, the chip in the MacBook most likely runs at higher clock speeds all the time. If you want to peep the specs of the chips in use here, I’ve lined them up at Intel’s ARK for you to compare. Let's move on to Geek Bench 3, which uses “real world” algorithms to measure CPU speed. It’s another squeaker win for the MacBook Pro 13, but a win nonetheless. 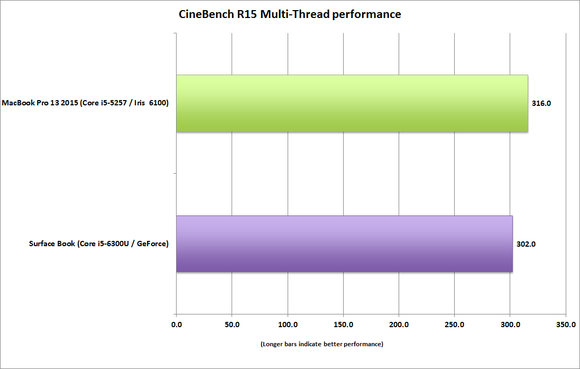 The same rule applies here as with Cinebench R15: The greater clock speeds of the hotter chip in the MacBook Pro is just cranking at too high a frequency for the Surface Book’s Skylake chip to keep up. I could show you a few more benchmark charts between these two platforms, but it won’t change unless I use something that might favor a new feature in the Skylake CPU, such as SpeedShift. Let’s just agree that on the vast majority of CPU-bound tasks, the Core i5 MacBook Pro is probably going to be a smidge faster than the Core i5 Surface Book. I'd generally rule it a tie in CPU performance, though, and this is why. Skylake is a 15-watt chip going up against a 28-watt chip. That’s a huge thermal and power difference. Given that disparity, Skylake still comes out looking pretty good. If you’re thinking Microsoft’s mouth was writing checks its hardware couldn’t cash, take a step back. Microsoft has never told me exactly what tests it used to determine the “twice” boost (believe me, I asked), but I always suspected it was mainly built around the GeForce chip. Of the many ground-breaking features Microsoft pulled off with the Surface Book, one of the crowning achievements is that GPU under the keyboard. You can see what a difference it makes in GPU-intensive benchmarks. First up is LuxMark 3. It’s a test designed to measure the OpenCL performance of a chip. OpenCL stands for Open Compute Language, and it’s an attempt to move general purpose CPU chores onto the GPU. For my test I ran the LuxBall load because other workloads crashed on the MacBook Pro 13. I wasn’t sure how this one would break, as Intel’s OpenCL performance has come a long way, but the result is certainly something that’ll make PC fans happier. 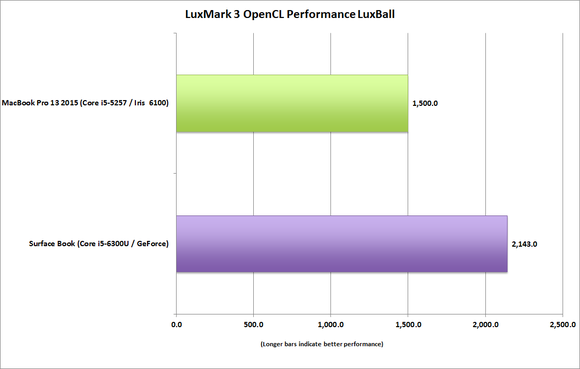 LuxMark 3 is a cross-platform OpenCL benchmark. I ran it on both of the graphics chips which is where OpenCL should run. That’s a pretty hefty performance advantage in OpenCL in the Surface Book’s win column. As fast as Intel’s Iris 6100 is with its 48 execution units, it’s still not enough. The performance gap in the next test opens up that lead even more. Next I ran Unigine’s Heaven 4.0 graphics test. The test was run at 1366x768 resolution with 2x AA, no tessellation and medium quality. I did this because the MacBook Pro 13 defaulted to many of those settings when started. On the Mac, the only graphics API is OpenGL, while the PC has DirectX and OpenGL. I opted for DirectX, as I don’t think it would have been fair to use OpenGL on the PC—Windows is all about DirectX, and it’s a big advantage for the platform. Full disclosure: I ran the same test with different settings to see how the graphics in both stacked up. Most of the tests showed the Surface Book with the same big performance margin, though I could also find settings that would drag down both laptop’s performance so they were the same. Still, I think is a fair representation. Rather than rely on a synthetic game benchmark, I also decided to throw a real game at it. Square Enix’s Tomb Raider is available on Steam on both platforms. It’s a fairly recent game and came out for PC and consoles in 2013. Feral Interactive ported the game to OSX the same year. One caveat here: As a port there’s clearly a lot of things that could be different between the PC version and the Mac version. For my test, I ran it at 1400x900, which was the default resolution on the Mac, and selected the “Normal” quality setting on both. I also poked around the game’s graphics settings to see if there was any variance between them that got lost in translation. 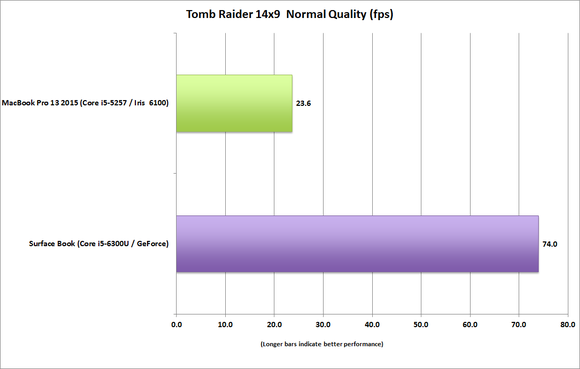 The result is a bone-crushing blow for the MacBook Pro 13: Tomb Raider ran at a pathetic sub-24 fps, while the Surface Book whizzes along at 74 fps. To be fair, if you've read this far, you know the Surface Book isn't twice as fast or three times as fast as the MacBook Pro 13 in all things. In this one game, however, at these settings it is and it does approach a being twice as fast in many tasks. And that's Benchmarketing 101 for you. Is it fair? Maybe not in some people's books, but then I'm sure they'd agree claiming an iPad is faster than 80 percent of portable PCs is wrong too. Tomb Raider really puts the MacBook Pro 13 at a huge disadvantage. If I were Microsoft PR, I’d pick this benchmark and start screaming. The GPU in the Surface Book isn’t just about gaming. Sure, that’s a nice bonus over integrated graphics, but the GPU really plays to other applications that need more graphics performance. CAD/CAM users, for example, can use it, and other professional-level applications should see a nice bonus with the discrete graphics chip in the Surface Book. 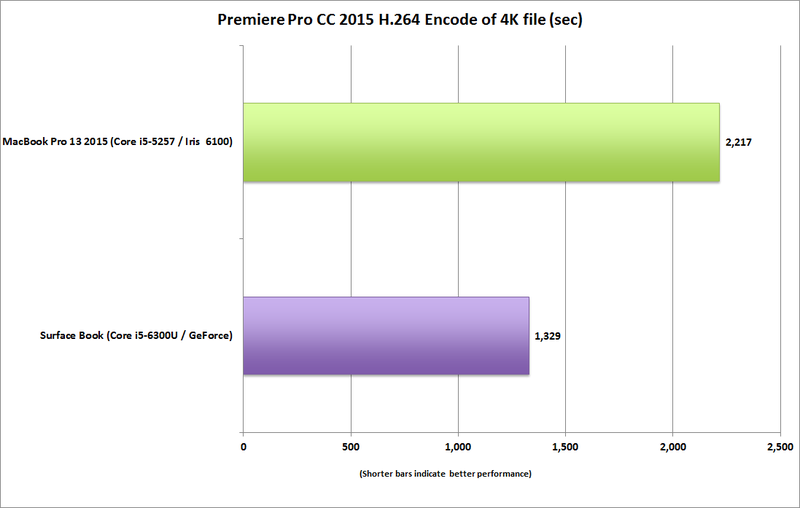 That’s why my last performance benchmark will be Adobe Premiere Pro Creative Cloud. Premiere Pro has used GPU acceleration for years. It originally supported only Nvidia’s CUDA but has since added OpenCL. Luckily it runs on both platforms, too. For my test I installed a Premiere Pro CC on both laptops, imported a 6.5GB 4K resolution .MOV video file, and then exported the movie to H.264 using the Vimeo preset at 1080p resolution with the maximum render quality setting enabled. On the Mac, OpenCL was used. On the Surface Book, CUDA was my choice because it’s an Nvidia chip. The result? Another crushing blow in favor of the Surface Book. For a professional, less time spent rendering means more productivity. On the Surface Book, it was done literally minutes ahead of the MacBook Pro 13. I leaned on Premiere Pro CC 2015 to encode a 4K H.264 file on both platforms and Surface Book pile drives the Macintosh. This wouldn't be complete without a battery run down test. As I can't run MobileMark 2014 on OSX, I resorted to a standard video run down test. I calibrated both laptops to the same 260 nit brightness, disabled screen dimming, and turned off the wireless. I also set the volume to approximately the same volume by listening to a test tone with a set of Samsung ear buds in each computer. Audio was left on with the same ear buds in the laptops. For a test file, I used the same 4K-resolution Tears of Steel .MOV file from my Premiere Pro encoding test. Normally, I like to run the same player, such as VideoLAN, to make it neutral. The last time I did that resulted in belly aching that the test is unfair because it doesn't use each OSes' optimized player. So for this test, I used the QuickTime player on OSX El Capitan. I would have used iTunes as Apple does on its official run down tests but an apparent bug in it prevents videos from looping. The QuickTime player is the default player anyway which some argue is what you should use. On the Surface Book I used Windows Movies and TV player which is also highly optimized for power and Windows 10. 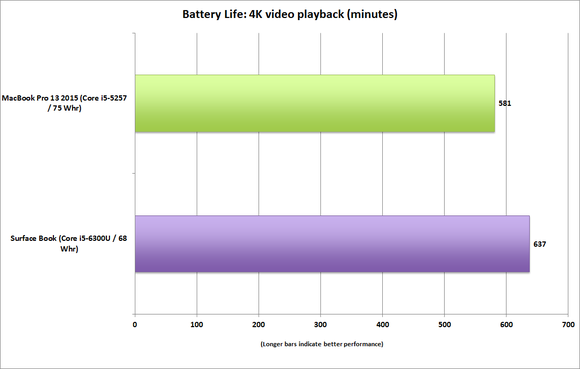 Both manufacturers actually claim 12 hours of battery life for movie play back. The MacBook Pro 13 has a massive 75 watt-hour battery while the Surface Book's is about 68 watt hours. That gives the MacBook Pro 13 about a 10 percent greater battery capacity over the Surface Book. After 8 hours, I called it a day. The MacBook Pro 13 was reporting 19 percent battery life with 2 hours of estimated battery life left. The Surface Book was reporting 29 percent with 2:26 left. I could have taken both down to zero, but I wasn't going to sit in my cubicle and watch the moon rise. I give the Surface Book the win by a small margin. What's really impressive is the Surface Book does it with a touch-screen which can consume 10 percent of run time and a smaller battery too. Both laptops actually offer fairly excellent run time overall but neither would have hit their rated life for lower-resolution file playback. When I clocked in the next morning, I decided to finish draining both laptops. I had shut both down and left them in place but decided to pick up where I left off. Full disclosure: I brain faded on the Surface Book and it didn't loop after the first run and instead sat on a black screen at the end of the video for three minutes (which is how far the MacBook Pro 13 had gone into the second loop.) I then paused the MacBook Pro 13 and started the Surface Book playback while letting the MacBook Pro 13 sit paused for three minutes. I then started both at the beginning with it set to repeat. The MacBook Pro 13 tapped out at 1:41 which was a little short what it had predicted. The Surface Book ran for almost an hour longer giving up about 2:37 of run time on the remaining charge from the night before. If you add both together, that gives the MacBook Pro 13 about 9:41 of playing 4K content with the Surface Book running for 10:37. This isn't an ideal battery run down test condition but probably realistic as plenty of people turn off their computers during take off and then turn them back on in the air. The win clearly goes to the Surface Book but both get kudos for long video playback performance. Despite having a smaller battery and a touch screen, the Surface Book edges past the MacBook Pro 13 in battery life while playing 4K video. There's one last issue to address: Price. Some may argue it should be the $1,500 Surface Book against the $1,500 MacBook Pro 13. This cuts to exactly what Microsoft is likely arguing: We figured out a way to put a GPU in a 13-inch laptop, while Apple and all other PC makers couldn’t or wouldn’t do it. The Surface Book's premium price is what a premium is about. You can’t get discrete graphics in any MacBook Pro, but you can on the Surface Book. And the payoff is clear.